For this double rifle the customer has given me a free hand regarding the design of the engraving. 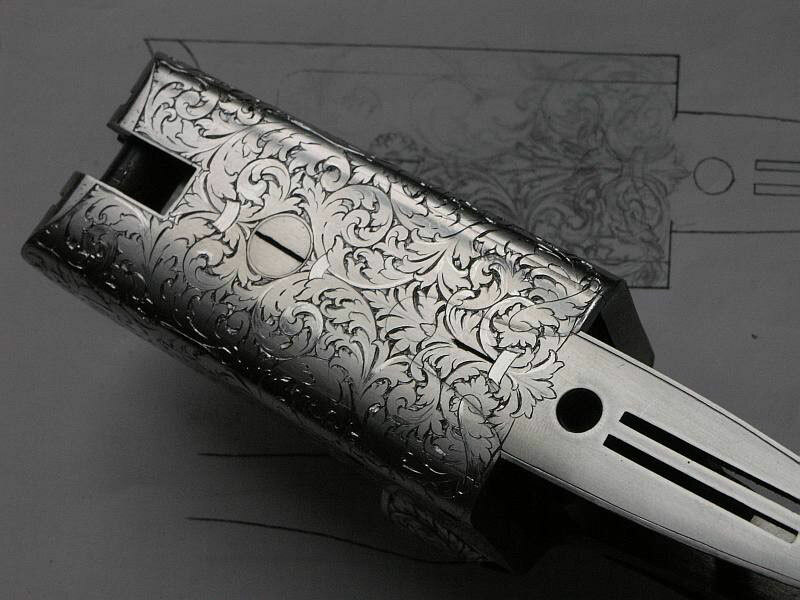 Therefore, the main focus was to create a design that would be in harmony with the shape and style of this Vintage double rifle and its British origin. After a few sketches it was clear what would work best. 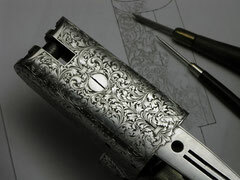 The fences are done in deep relief engraving, also known as chasing. 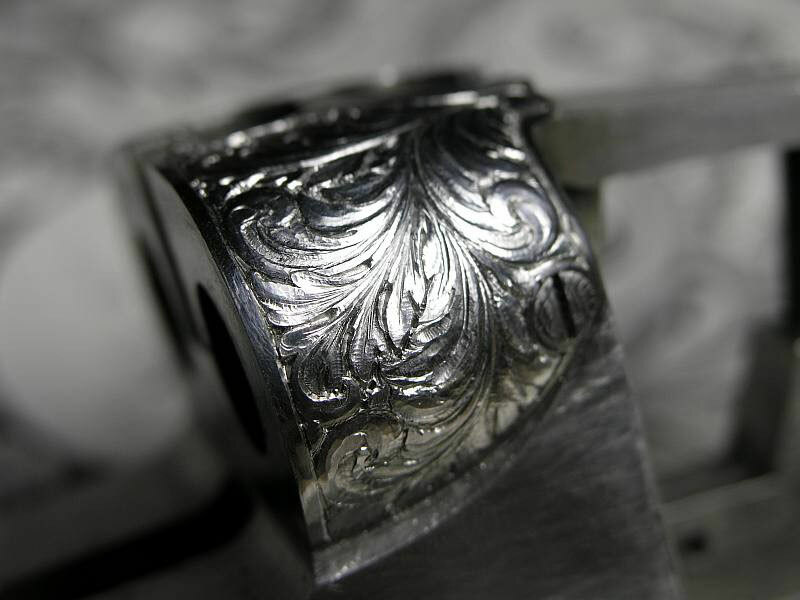 Work of this nature is always carried out before the fine engraving is done. After drawing and scribing, I pre-cut the outlines of the scrolls using an onglette graver. Then it goes deeper into the steel, this time with hammer and chisel. The surface of the ornamental motifs is shaped with various gravers and then scraped smooth. There are small background areas which are cut even deeper. After the chip-removing-work the surface can be finely chased with punches. The punches are guided with the left hand and are tapped by a lightweight special chasing hammer. The pressure of these tools leads to a plastic deformation that shapes and smooths the surface of the steel workpiece. The result is the final shape and a certain surface structure. Punches must be available in large numbers, varying in size and shape. 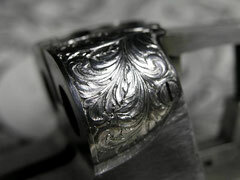 Unlike the engraver´s cutting tools, they do not become blunt during use. Because the shapes of leaves and ornaments always get slightly wider during this operation, I have to re-cut the side walls and edges of the leaves repeatedly. It is all about achieving a nice shape and maximum sharpness. By treating the background with a single-point punch, it is matted and therefore does not reflect light and appears dark. As can be seen in the picture, I have shaded the ornaments with a few lines. The same way I also work on the second side and on the opening lever. After completion of the relief engraving on the fences, I draw the rest of the design onto the steel with a pencil. Before doing so, I tap the surface with plasticine. This creates a thin layer of grease and enables me to see the line of the pencil. Many corrections are necessary until the drawing is perfect and all scrolls are flowing nicely. Only then the drawing is traced with a polished steel scriber making the lines permanent. 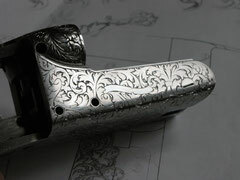 On this double rifle the foliate scrolls are designed to flow around the edges to the bottom of the rifle. This looks nice, but takes some extra effort in design. After scribing I can engrave the backbones of the scrolls and the inner work - again an onglette graver is the tool of choice. After that the background was cut deeper with a small flat graver. 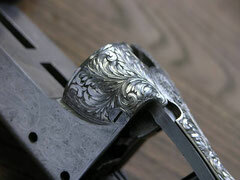 This additional step gives more depth and the finished engraving will look even better. The engraving tools are made from High-Speed-Steel or carbide and are seated in a wooden handle. The tips of the gravers must always be kept very sharp. On the underside of the action the axis of symmetry in the ornamental design is clearly visible. In order to achieve a good symmetry it is desirable to engrave one half first and then transfer the outlines of the design to the second side. Often the shape of the trigger plate plays an important role. 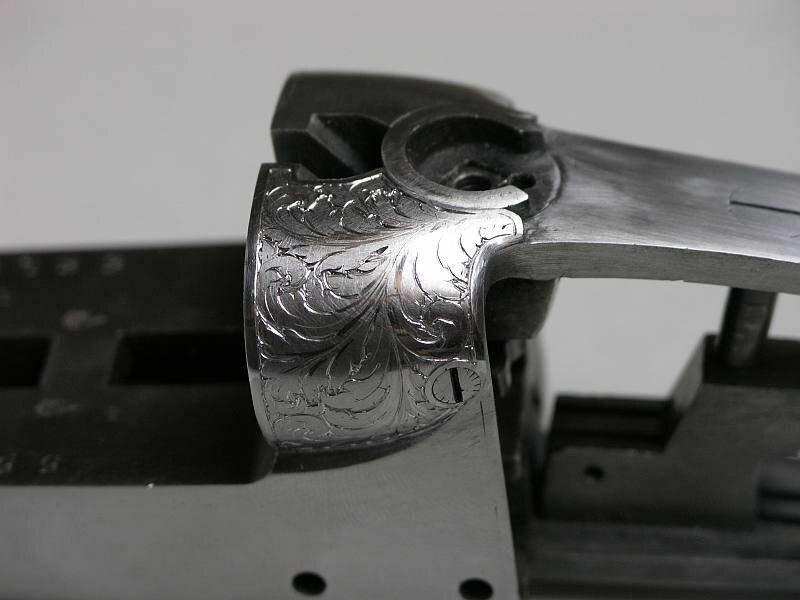 This part of the gun is mounted into the bottom of the action and the fit and screws may influence the design. During engraving the piece is firmly held in an engraving ball. This vise can be rotated and has a spherical bottom that also allows pivotal movement. In this picture the background of the engraving already has been matted. This gives the background a very dark appearance and the design stands out bright and contrasting. Finally the engraving is shaded. Shading consists of a large number of fine lines. These represent the dark areas of the ornamental motif and the effect achieved can be seen well in this picture. Aside of the gray value, shading also gives structure to the ornamental work. For this step it is particularly important to maintain high quality throughout the whole piece. 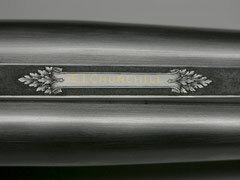 Even slight errors in engravings are close to impossible to correct and would stand out. An engraver must never neglect the work on the trigger guard or on the many small parts and screws. 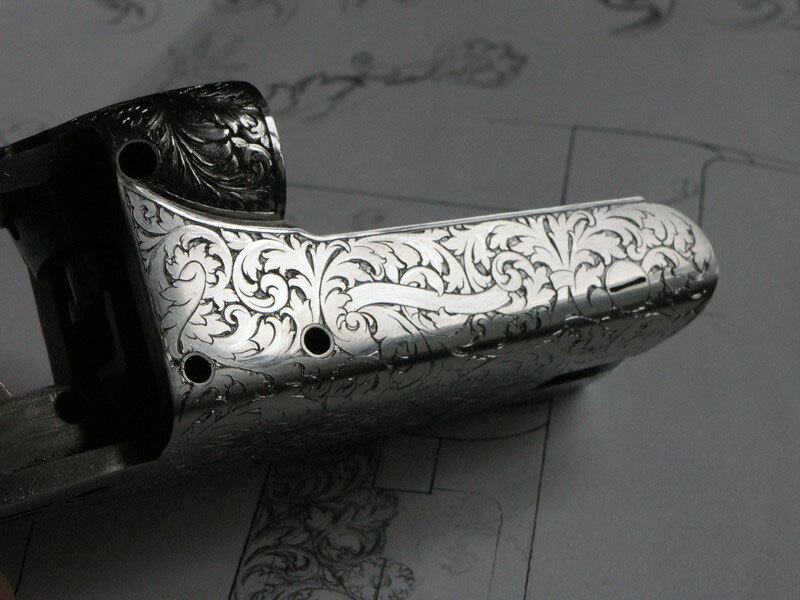 The quality of work on these parts especially is an indicator for estimating the overall quality of an engraving. These should show the same high level of quality as the rest of the work. Finally the barrels are engraved. 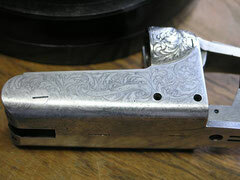 In most cases inscriptions, serial numbers, the manufacturer´s name, caliber etc are to be engraved. In this example I have inlaid the lettering in gold. 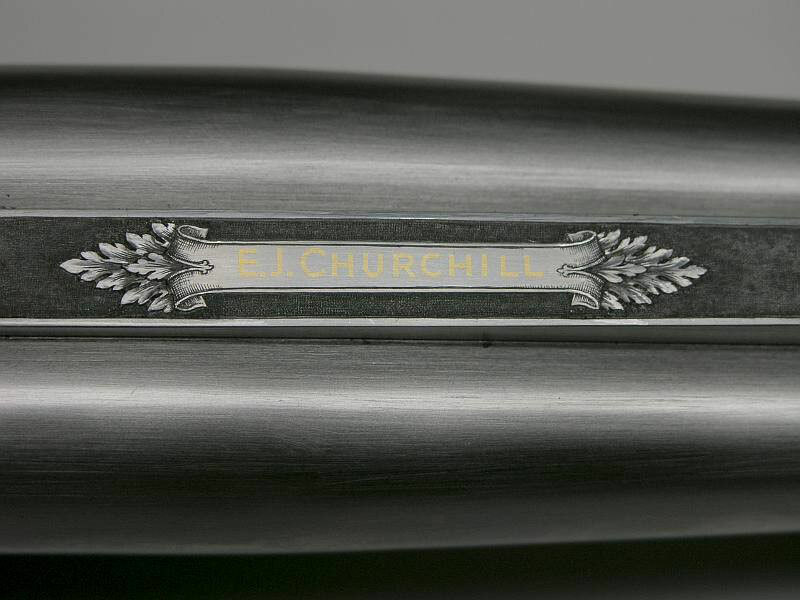 On fine guns the matting of the rib and the engraving of the scope mount should also be done by the same engraver in order to obtain a uniform appearance. The finished work can be seen on the home page and in the photo gallery.